USA Grading, Inc. | Florida Dumpster Rentals, Site Grading and More. A roll off dumpster is an easy and reliable way to take care of cleanup for a wide range of projects. USA Grading provides roll off dumpster services for Residential and Commercial customers. Our services provide superior, reliable, solutions to our commercial and residential customers. We specialize in large developments and custom projects. to cover all the sitework your home or community will need. We can help provide roll off dumpsters for any projects. Our rental solutions are easy and inexpensive. We provide professional and competitive demolition services throughout Lee and Collier counties. Whether you need a log, tract or acreage cleared, our team specializes in land clearing services. We maintain a large supply of fill dirt in our Southwest Florida yards that we haul with our fleet of dump trucks. We specialize in large development and custom site grading for commercial and residential customers. USA Grading has the necessary equipment and expertise to perform any size swimming pool excavation. USA Grading, Inc. has performed over 20,000 site grades. Our founder, Domenick Catalano, started USA Grading with one machine, truck and trailer.  Since then USA Grading, Inc. has grown to employee over 50 staff members and service 5 of Southwest Florida’s counties. We strive to provide our clients with professional and cost efficient site and waste services. Mention ‘MARCO USA’ When Ordering Your Dumpster. Contact us for more information about our hourly rates, or to setup a grading or waste management package. We have been Stock Developments Site Grading Company for the past 14 years.